You might hear it being referred to as online marketing, or modern marketing but all of these terms encompass the elements which we’ll be discussing here under the most commonly used term of ‘digital marketing’. And as electronic devices have been around for many years now, so too has the concept of digital marketing. However, it wasn’t really until the Internet became easily accessible in the early 2000s that this term gained its popularity. This is likely why people often seem to think of digital marketing in terms of the Internet and more specifically in terms of the Google search engine. The truth is that Google makes up only a small portion of what digital marketing is all about, but more on that in just a moment. First, I want to take you through the reasons why digital marketing is the logical answer to three major problems with traditional marketing and advertising methods. ps. don’t have time to read? Watch the video below instead! Yes and no. There are three main reasons why traditional marketing techniques are no longer as effective as they used to be. Imagine having your business featured in a newspaper. It’s amazing exposure but it’s incredibly temporary. If someone wanted to look at that content a year later, chances are that newspaper would have been long gone. As opposed to being featured in an online magazine or blog post where the content lives on forever. Companies would pay millions of dollars for billboard ads or TV commercials without really knowing who would end up seeing their content. Instead of paying for sheer volume of people to see your stuff, while advertising online you’re able to pay to put your content in front of your ideal customers. A huge company like Coca Cola might have had hundreds of billboards, TV commercials, radio commercials and print ads out at any one time. If there was an increase in sales they would have no idea how to determine where those customers were coming from. With digital marketing, it’s really easy to see what’s working and what isn’t. As I said before, digital marketing is anything that involves marketing (or promoting) of products or services through an electronic device. Now, I’d like to elaborate on this by saying that this doesn’t just involve the likes of Facebook ads, Instagram ads or Google ads. It involves nearly anything that a brand says or does that is shown and accessible online. I like to think of digital marketing as an electronic Rubik’s cube, in that it has so many different elements that have to align just right in order to execute the perfect digital marketing strategy for any business. We’ll now dive into each of these a little deeper. Your digital marketing freebie awaits! Subscribe to get our newsletter and get instant access to your freebie. In it, you’ll find links to some of the best online tools, blogs, videos, and podcasts that’ll help you to fast track your business growth through the power of digital marketing. Send me my digital marketing hacks! Blog posts like the one you’re reading now will have specific keywords that people often search for on Google and other search engines. This keyword, in the case of this post, “digital marketing”, will be used in the title and throughout the blog post itself to help Google identify the topic of the post so it can show it to people searching for that topic. You want to ideally pick targeted keywords that are three words or more which are called long tail keywords. For example the keyword ‘exchange’ would likely end up getting seen by people looking for articles within the financial world. While an article using the keyword ‘Italian foreign student exchange program ’ would pop up for people searching for student exchange programs to Italy. Likewise targeting broad single-word phrases like travel, cooking, family etc. will mean your site gets buried in the pages and pages of search results from popular sites like Huffington Post, Wikipedia and CNN. I love the Keywords Everywhere tool. It’s a free Google Chrome extension that allows you to see how many people are searching for a particular keyword and also gives you similar keyword alternatives. Yoast is a free plugin for WordPress is also an absolute lifesaver as it will tell you how good your SEO score actually is on each post. Finally, I absolutely love the Co-Schedule headline analyzer for helping me to create better titles for my blog posts that are both clickable and search engine optimised. While SEO aims to use organic (free) methods to help websites rank higher in search results, Search Engine Marketing refers primarily to the use of paid search engine results. For example, as you can see below, when I type ‘digital marketing’ into Google. The top 5 results are ones that companies paid to display. The last of the red arrows points to an Indonesian website which has obviously targeted me based off of my current location (Bali, Indonesia). There are incredibly complex strategies behind these placements so you might see completely different results from me if you do your own search. 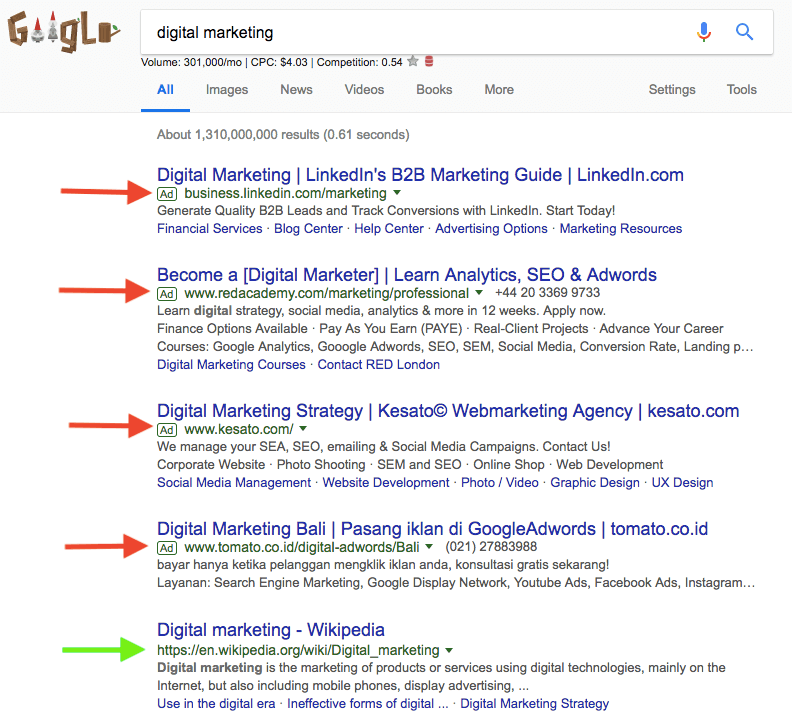 Finally, you’ll see the lime green arrow points to the first organic search result which is a Wikipedia page about digital marketing. 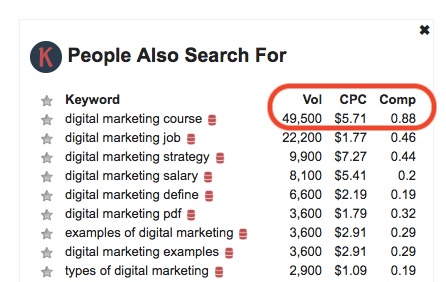 This means that if someone was to search for a ‘digital marketing course’ you could pay to be featured as one of those top results on Google for this term and pay around $5.71 per click that this ad gets. 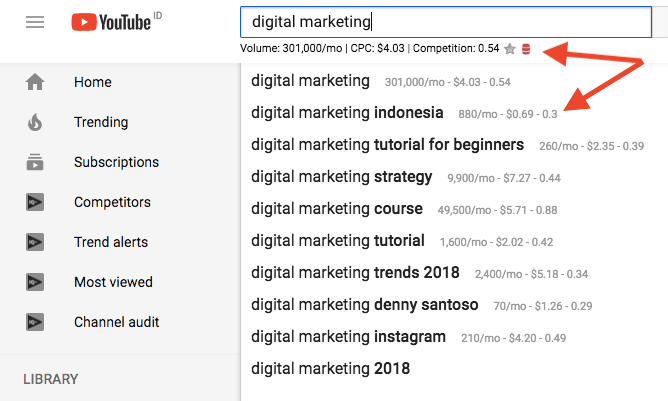 Improve your digital marketing approach through SEM: This is a very simplified explanation of how this all works and if you want to learn more I suggest checking out videos like this one by Neil Patel. Also, make sure to check out the free blog by Moz.com for all things to do with search engines and how to rank higher and advertise smarter. “Content marketing is a strategic marketing approach focused on creating and distributing valuable, relevant, and consistent content to attract and retain a clearly defined audience – and, ultimately, to drive profitable customer action.” – Content Marketing Institute. Basically – lucky for people like myself and Nick, who are practically allergic to traditional selling techniques, content marketing is all about building valuable connections through quality content. The ‘sell, sell, sell’ approach has now been replaced with ‘give, give, give’. Brands do this by providing their audience lots of awesome, free content through podcasts, videos, blog posts etc. and simultaneously helping to increase overall brand awareness. Improve your digital marketing approach through content marketing: Gary Vaynerchuk is an incredible example of just how powerful content marketing is. Gary provides his audience consistent, high-quality, engaging content on a daily basis without asking for anything in return. His YouTube channel has over 1.4million subscribers and he has practically built his empire on the power of incredibly valuable, free content that directly answers the questions his audience has. As its name suggests, social media marketing (SMM) refers to any efforts aimed at promoting a brand and its products or services through various social media platforms. This primarily includes Facebook, Instagram, YouTube, Pinterest, Snapchat, and Twitter. Some additional platforms that often get overlooked as social media platforms but definitely fall under this category are LinkedIn, Google Plus and Tumblr. It’s important to note that this includes both organic and paid marketing efforts on these platforms. Everything that a brand says, does, creates and posts on social media is a part of this. The Instagram bio, the post and its caption, the hashtags that are used, the filters used, even the tone in which a brand speaks to followers through comments. These are all examples of what falls under the umbrella of social media marketing. 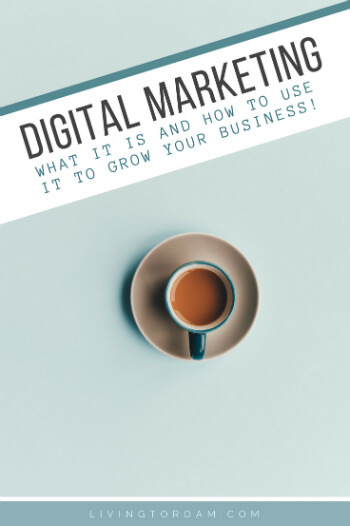 Improve your digital marketing approach through SMM: Basically everything by Kim Garst is amazing at helping you to understand social media marketing better so check out her blog here. On this blog you’ll find tips for complete beginners as well as more intermediate and advanced social media users. “Affiliate marketing is the process of earning a commission by promoting other people’s (or company’s) products. “ – Pat Flynn of Smart Passive Income. Of course there’s good and bad affiliate marketing. The right way to do affiliate marketing is to only promote products or services which you truly believe in and which your audience really needs. Let’s say your business is in the health and wellness niche. An organic detox tea company is willing to pay you 15% of every product sold through your unique discount coupon. While a yoga mat producer is willing to pay you 30% but they’re known for using environmentally unsafe practices in the production of their stock. Although both are aligned with your niche and one is willing to pay you double the commission and for a higher-priced product, you’re still better off promoting the product you believe in. Your audience is likely to hold the same ideals as you, so if you feel unsure about promoting it, they won’t be inclined to purchase it anyway. From the business end, affiliate marketing can be a great way to get your products and services in front of other people’s audiences without having to pay for advertising. Plus you don’t actually pay anything to your affiliates unless their audience actually buys your product or service. This is great for businesses just starting out who don’t have a large marketing budget. Becoming an affiliate: Michelle from Making Sense of Cents is the goddess of affiliate income. She regularly publishes her income reports often earling $50,000 + per month through affiliate income alone. Using affiliates: Check out this video by Neil Patel to help you leverage the power of affiliates for your own business. Email marketing is perhaps the most important side of our Digital Marketing Rubik’s Cube. The reason for this is because it’s the one thing you actually own when it comes to your customer’s data. You don’t own Facebook, Google, Instagram or any of the other digital platforms through which you communicate with your audience. You do, however, own your email list and that’s incredibly powerful. You would be surprised to know that there are people out there operating successful businesses with just a one page website and an email list. How can people do this? Well email has an average return of $38 for each $1 spent. Meaning that if you spend $1 to get someone onto your email list, you have a potential 3800% return on your investment. That’s a whole lot higher than every other marketing strategy so it’s definitely worth getting it right. So much of your email marketing success will come down to being a clever copywriter and writing emails that people can’t wait to open. 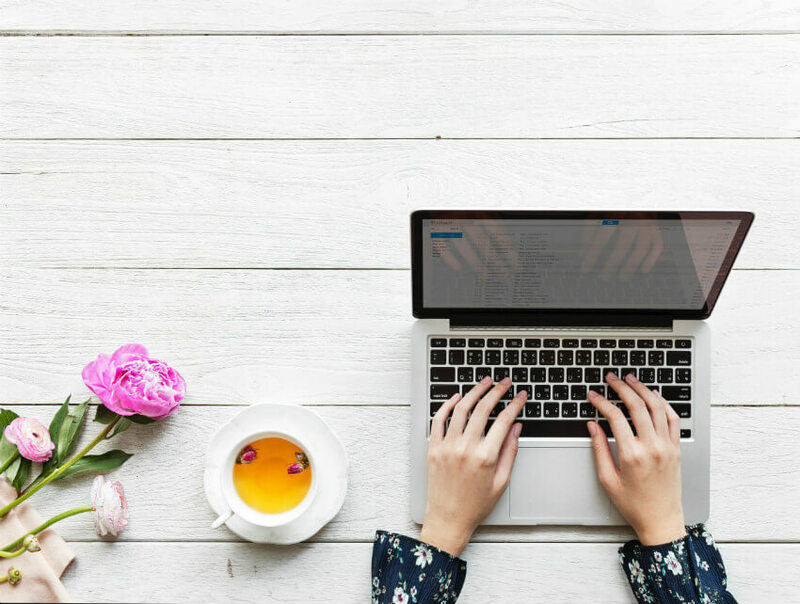 Check out the Kissmetrics beginner’s guide to successful email marketing if you’re just getting started (or if you need a refresher). Also, Copyblogger is an incredibly powerful resource if you’re looking to improve your writing skills. Their tagline literally reads “Words that Work for Digital Marketing and Sales” so that alone should tell you these guys know their stuff! What’s more important – quantity or quality? We’ve now covered all the different elements of digital marketing, now let’s get into why it’s so important for all of these elements to work together. The American Marketing Association and others have stated that we see up to 10,000 brand messages per day. That’s an enormous amount of information that we’re processing both consciously and subconsciously. As a result, the average number of times a customer has to see your product before they make a purchase has been estimated by some to be as high as 20. Of course it does depends on the price point. The lower the price point the smaller the amount of advertising messages needed to make a decision and vice versa. However, what’s more important than the increase in frequency of exposure to a brand or product, is the quality of the content. Our attention spans are decreasing rapidly as we are continuously switching between platforms, reportedly up to 21 times an hour. This means that in order to capture your customer’s attention, you have to produce high-quality and unique content. Brian Dean is the godfather of the quality over quantity method. At the time of writing he has over 130,000 YouTube subscribers with only 21 videos. He has created incredibly detailed and helpful videos centered around in-demand keywords which people frequently search for. This is the basis of any good digital marketing strategy – create content with your customers (not yourself) in mind. Which questions do they want answered? What do they like to watch? What problems are they facing? Who else do they follow online? Where are they actually present online? It’s incredibly important to know your ideal customers inside and out before you create any content. So although all six of the elements we’ve talked about in this post are important, it doesn’t mean that you have to master all of them to run a successful business. For example, if your business is an eCommerce clothing brand aimed at 18-25 year old women then you would likely focus your time and budget on Instagram, Facebook, Pinterest email marketing, and content marketing. Unless you had a big budget you may not invest into SEM or even SEO and you’d definitely be wasting your time with platforms like LinkedIn and Google Plus. On the other hand, if your business is a brick and mortar dentistry, your focus would be completely different. You’d likely focus a lot on search engine optimisation and advertising as people would be much more likely to look to Google for a good local dentist rather than look on Instagram. So you can understand why it’s incredibly crucial to know who your audience is and how to best market your products and services to them prior to spending a lot of time and money on wasted digital marketing efforts. If you’re looking for additional help with this, Digital Marketer has a great article on how to get really clear on who your customers are and what they need. 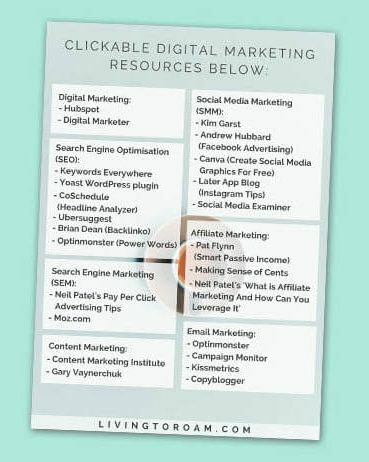 I hope you’ve found this guide helpful and that it will help you to be better at your own approach to digital marketing. Got questions or your own tips for how to be better at digital marketing? Drop them in the comments below!